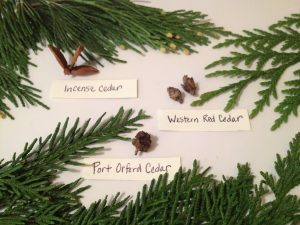 Article from Elise @ wildfoodsandmedicines.com – Cedar is a powerful antimicrobial. Reflect on where it lives – cool wet forests where fungi and molds thrive. When you scratch cedar leaves or cut the wood, strong essential oils are released. These oils are cedar’s medicine to repel insects, molds, fungi, bacteria and viruses. Our ancestors discovered this long ago and used cedar’s medicine topically and internally to ward off external forces. I am the heat of your hearth on the cold winter nights, the friendly shade screening you from summer sun, and the dancing bows that capture your imagination. I am the beam that holds your house, the board of your table, and the roof that shelters you from rain. I am the handle of your shovel, the bark of your basket, and the hull of your canoe. I am the medicine that heals you, the incense that carries your prayers, and tea that is used to cleanse your home. I am the wood of your cradle and the shell of your coffin. I am the breath of kindness and the flower of beauty. Cedar leaf is a useful anti-fungal for skin and nail fungus. The tincture, infused oil or salve can be used topically and should be applied 2-3 times a day until a week after the fungus disappears. Fungal infections are pernicious and need to be treated aggressively. You can also soak your feet in cedar tea by steeping a cup of dried cedar leaves in about 10 cups of hot water. Let the tea steep until it is warm and then place it in a bowl or basin large enough for your feet. Soak your feet for 10-15 minutes. All you need is a few sprigs of cedar, a bowl, scissors, a towel and hot water for steaming. 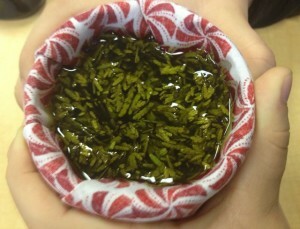 Cut the cedar leaf into small pieces until you have ½ to 1 of a cup in a medium sized bowl. Pour boiled water over the cedar until the bowl is half full. Place your face over the steam at a comfortable distance and cover your head with a towel. Breath deep! Try to steam for at least 5 minutes. Pour more hot water in if necessary. Steam 2-5 times a day. For chronic coughs or sinus congestion steaming more often may be necessary. Variations: Other herbs including fir needle, pine needle, eucalyptus leaf, rosemary, peppermint, yarrow or lavender can also be added. You can add one to two drops of essential oil if desired. Eucalyptus helps to thin mucus, peppermint is anti-inflammatory and rosemary stimulates circulation. Many essential oils including lavender and those mentioned have antimicrobial or immune stimulating properties. 3. For every 1 oz. of leaves, measure out 2 ounces of vodka in a cup measure, and then pour it over the leaves. If you have 4 ounces of leaves, you will use 8 ounces of vodka. 4. Strain the cedar oil with muslin cloth. Compost the pressed leaf and place the oil in a glass jar. 5. Label and store in a cool dark place. Cedar oil will usually last several years. Our “cedars” in the Pacific Northwest have scale – like leaves and belong in the Cypress family. Each has its unique fragrance and form, but they can all be used for respiratory steams, infused oils and incense. Incense Cedar – This beautiful cedar thrives in both dry and wet landscapes from Northern California to Mount Hood in Oregon. While it does not grow wild in Washington, I am including it because it has become a popular ornamental tree. Incense cedar does not grow in flat sprays like Western red and Port Orford cedar – it appears to have wild branches that turn in different directions – a wild hair-do of sorts. The cones look like a duckbill with a tongue sticking out or a trident. Incense cedar is very fragrant and makes a beautiful smelling infused oil and incense. Sources – Arno, Stephen and Hammerly, Ramona. Northwest Trees. 2007. Miller, Bruce. Sayuyay a ti tuwaduc, Herbal Medicine of the Twana. 1998. Moerman, Daniel E. Native American Ethnobotany. Timber Press, 1998. Moore, Michael. Medicinal Plants of the Pacific West. 1993. Pojar, Jim and Mackinnon, Andy. Plants of the Pacific NW Coast. Lone Pine, 1994. Preston, Richard J. North American Trees. Iowa State University Press, 1980. Randall, Warren R. Manual of Oregon Trees and Shrubs. John Bell; 1998. Seller, Adam. Clinical Strategies and Herbal Therapeutics Class, 2003. Cedar is one of our most versatile trees. From the beautiful wood for woodworking, to its medicinal properties … The many uses in our spiritual workings, you won’t find too many other members of the plant world with so many uses. I agree and they are my absolute favorite!